In the field, the Captain has not gotten any better with age. What has it cost the Yankees? For the third time this season, Derek Jeter is back. It’s more of a tentative return than a triumphant one, since the 39-year-old’s last two attempts to play led to rapid returns to the disabled list. But maybe this is the one when Jeter’s balky lower body will prove capable of keeping him on the field for more than four games at a time. If it is, the .225/.286/.307 line that Yankees shortstops have produced might start to look slightly more respectable. Even an admittedly diminished Jeter, sans muscle strain, can be counted on to deliver a steady supply of opposite-field singles; aside from a low-BABIP blip in 2010, his bat has never been a source of concern. It’s his glove that causes all the controversy. “He’s a guy that has been very successful at the top of the order and has played very good shortstop for us,” said manager Joe Girardi after Jeter’s 0-for-3 effort on Monday night in Toronto. No one would take issue with the first half of his statement. Plenty of people would refuse to accept the second. Jeter has long been baseball’s most polarizing defensive player. In the right crowd — a mix of sabermetricians and the regulars at Stan’s Sports Bar — it takes just three words (“Derek Jeter’s defense”) to touch off a debate between people who are equally convinced that the Yankees captain is either one of the best or one of the worst defenders of all time. The “best ever” argument is easy. Jeter has the hardware; only four shortstops can top his total of five Gold Gloves. He’s one of the few fielders who have a signature move, the instantly recognizable Jeter jump-throw. He even has a pair of pantheon plays: the 2001 ALDS-saving maneuver commonly referred to as “the Flip,” and the header he took into the stands after chasing a popup in 2004. Granted, that deficit has something to do with Jeter’s age, longevity, and durability. Fielding performance peaks early for shortstops, which means that Jeter has spent most of his lengthy career in defensive decline. He’s a few healthy weeks away from setting a record for defensive games at shortstop, so he’s had more opportunities for misplays (and missed plays) than almost anyone else. But even when looking at smaller slices of his career you can see the story of a flawed fielder unfold. Young Jeter or old Jeter, UZR or DRS, massive sample or small, the stats are unified in their disdain for Jeter’s defense. The last thing the Internet needs is another article about Derek Jeter’s defensive statistics. At this point, anyone who’s inclined to believe that a number fancier than fielding percentage can tell us something about fielding skill has already been convinced, and anyone who isn’t won’t be swayed by repetition of the same facts and figures. What might work is an approach that synthesizes stats and the old-fashioned eye test. Fortunately, that approach already exists. It just needs a new paint job. In 2006, John Dewan and Baseball Info Solutions published the first edition of The Fielding Bible, which promised to “completely change the entire perception of fielding statistics in Major League Baseball.” The book introduced the “plus/minus” system that forms the foundation of Defensive Runs Saved, BIS’s proprietary defensive statistic. BIS claimed that by combining computation and observation, plus/minus could provide accurate assessments of fielding performance. The company’s video scouts watched every play from every game, recording the direction, type, and velocity of each batted ball. Then the plus/minus model assigned each one an out probability. Armed with that information, BIS believed it could answer the question “How many plays did this player make above or below those an average player at his position would make?” The process has been refined since then, but the basic framework remains the same. Bill James, then as now a foundational figure of sabermetrics and an adviser to the Red Sox, served as The Fielding Bible’s resident skeptic, leading off the book with an essay titled “Jeter vs. Everett.” James knew that the numbers said that Jeter was a bad defensive shortstop, and he knew that the Gold Glove voters and sign-waving, marriage-proposing Yankees fans insisted otherwise. He just wasn’t sure which to believe. So Dewan gave him a DVD, which is how people shared data before Dropbox. On the DVD were the best 20 plays by Jeter and the worst 20 plays by Jeter (not including errors), according to plus/minus. Also on the DVD were the best and worst 20 plays by Adam Everett, a good-field, no-hit Astros shortstop whom the system rated as baseball’s best. James watched all 80 plays, noted the stylistic distinctions between Jeter and Everett, and came away converted. We can’t add Jeter vs. Everett ’06 to our Netflix instant queue to see what James saw. (Sadly, Striptease isn’t available either.) And we can’t watch Everett in action, since he retired in 2012. But we can re-create Dewan’s DVD with GIFs and a new costar, substituting a current player for Everett to see whether the visual contrast between fielders is still as striking today. I asked Ben Jedlovec, vice-president of Baseball Info Solutions, to send me what BIS deemed to be Jeter’s 20 best and 20 worst plays from 2011-12. Playing the part of Everett is Mariners shortstop Brendan Ryan, Everett’s spiritual successor as a weak hitter with a phenomenal glove. Jedlovec included Ryan’s best and worst plays from 2011-12, too. Jeter, at minus-33 runs, was BIS’s worst-rated shortstop over that two-season span; Ryan, at plus-45, was the best. BIS has addressed some of these complaints by timing every batted ball, but positioning remains a partial unknown. And as we’re about to see, positioning can be pretty important. I plotted the 20 best plays by Jeter and Ryan on the diagram below, making the best estimate I could of the point where each ball was fielded. 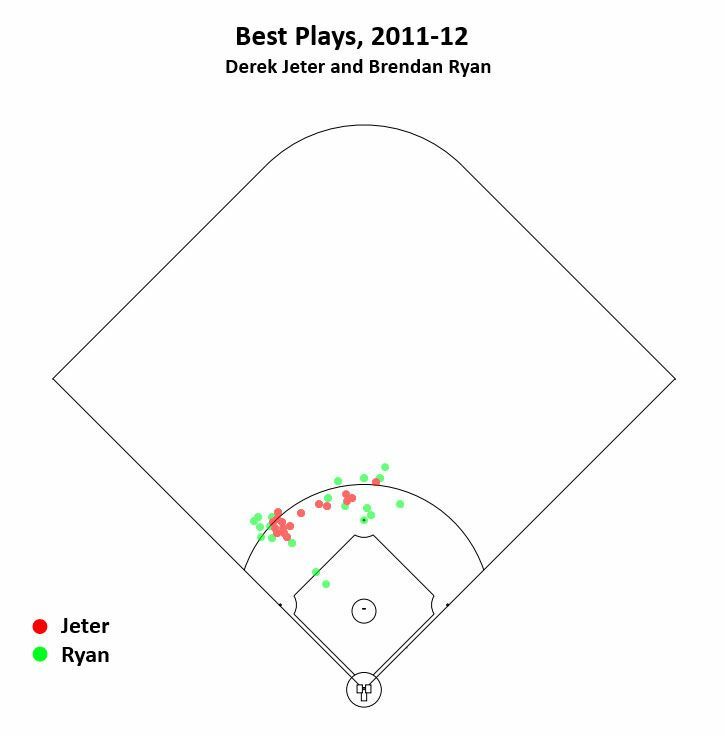 If you’re plotting along at home, you can find video of the top 20 plays for Ryan here, and the top 20 plays for Jeter here. It’s simple enough to determine that ball’s location, since both bases are visible. But in many cases, the camera is so zoomed in that by the time the ball gets to the glove the bases are hidden. This makes the fielder the only frame of reference. How do you pinpoint the ball’s location when this is all you can see? You can back up until you get to a frame that gives you a better sense of where the ball is, but some amount of guesswork is involved. This uncertainty introduces a potential bias into the plotting process: If the fielder’s location is all you have to go by, then you might be tempted to judge the difficulty of the play by his proximity to the ball. That would tend to favor players with poor range, whose distance from the ball might cause certain opportunities to be deemed more difficult than they are. If anything, though, that means that DRS could be understating the difference between Jeter and Ryan. I think I probably do. The play on the backhand — the one where Jeter likes to go with the jump throw. That’s what he does best, so it’s good for him, and I’ll do it from time to time. But for me, it’s more the backhand and throwing on the run. I’m able to get a lot on that throw, so it’s easier for me to do it in that fashion. However, there’s only one ball that gets by him and rolls into the outfield (oddly enough, it was hit by Jeter, whose lack of range may have rubbed off on Ryan for one play). Ryan’s range is such that he gets to anything hit in his vicinity, even if he can’t quite convert. But he doesn’t have any that look like Ryan’s bobbles. That’s one of the reasons (along with his offensive production and overall visibility) why Jeter has won over Gold Glove voters; the fielders who win the award tend to be sure-handed, rather than rangy. Jeter gets outs on an above-average percentage of the balls he gets to, which helps obscure the fact that he gets to so few. It’s telling that errors are recorded only when a fielder has mishandled the ball, even though not even getting close to it might be the greater crime. We’re more likely to remember a fielder’s sins of commission than we are his sins of omission. With Jeter at short, that ball sneaks into center more often than not. In this case, though, there’s a runner on first with no outs, so Jeter is playing at double-play depth, pinched in toward second. Thanks to that positioning, he needs to take only a few steps to gobble up what otherwise might have been a base hit. In a sense, that Ibanez quote about flawed metrics and flawed Gold Gloves is right. BIS tracks pronounced shifts whenever it can, but it doesn’t record more subtle shifts in positioning. Those same shifts generally aren’t detectable on TV. As a result, the stats might overrate the range of a perfectly positioned fielder, or suggest that a poorly positioned fielder moves much worse than he does. What we don’t know is how much this matters. If a well-positioned fielder is responsible for where he’s standing, then his smart positioning is a skill, and he deserves to be praised. If he’s being positioned by a manager or coach, he’s getting credit for someone else’s work. In a retrospective sense, the distinction is irrelevant, but it might matter when projecting future performance. If you plan to trade for a highly rated defensive player, for instance, you’d want to know whether his ratings are the result of his own ability or attributable to a coach. The positioning/range quandary could have implications for aging as well. A player whose defensive performance depends heavily on positioning might be expected to experience a more gradual defensive decline, since while range and reaction time decrease over one’s career, positioning should only improve with age and experience. Without information from a precise motion-tracking system like FIELDf/x, there are still a lot of unknowns. Jeter is now playing so far back that he can’t charge in quickly enough to convert. James also observes that “Jeter, in 40 plays, had maybe three plays in which he threw with his feet set” and “there was literally not one play in the collection of his 20 best plays in which Jeter planted his feet in the outfield grass and threw.” While there’s still the odd jump-throw or rushed delivery in this updated selection, Jeter throws with his feet set in almost half of his top 20, and we’ve already seen him throw out Hunter with both feet firmly planted outside the infield. So what is Jeter doing differently, and how can he still rate so poorly in BIS’s eyes if he’s no longer making the same mistakes? In 2007, his age-33 season, Jeter’s DRS fell to minus-24, and Yankees GM Brian Cashman reportedly noticed that he “hadn’t lost one step, but two.” After the season, Cashman took Jeter to dinner and found a tactful way to tell him that his defense was hurting the team. This came as news to Jeter, who’d never heard that message from anyone else in the organization. To his credit, he took the tip to heart and spent the winter working on his lateral movement with a new fitness trainer. In 2008, Jeter’s DRS improved to minus-10. And in 2009, after working with Yankees infield coach Mick Kelleher on “aggressive defensive positioning,” Jeter posted a plus-3 DRS, the first time he’d ever cracked positive territory. Given how well Jeter hit that season — .334/.406/.465 — the thought of him wielding a good glove to boot is almost as scary as a mask of his face. (No wonder the Yankees went all the way.) But that was as good as it got: The next year he fell back to minus-9, and then minus-15, and then minus-18. So this is the tragedy of Derek Jeter’s defense: Just when he finally found out how to play shortstop, he began to get old. Jeter no longer makes as many fundamental mistakes as he did in his early thirties, the last time someone studied his best and worst plays. But at an age at which only a handful of players have managed to spend a full season at shortstop, he lacks the speed to take advantage of his improved positioning. All of which makes Jeter’s defensive evolution one of baseball’s best might-have-beens. If Cashman had taken Jeter to that dinner about defense a decade earlier, how valuable could he have been? And how many World Series would the Yankees have won? How flawed are the Gold Gloves? Jeter has won three since James’s essay appeared. Everett’s and Ryan’s combined career total: zero. Of course, defense isn’t everything. Jeter’s bat, baserunning, and intangibles (if you’re into that) make him a Hall of Famer, no matter how bad you believe his glove to be. Ryan’s bat makes him a bench player who makes pretty plays.